The Black IPAs have been increasing their presence on our local shelves, with Hop in the Dark, Sublimely Self-Righteous, Dogzilla, and Pitch Black having all shared cooler space. 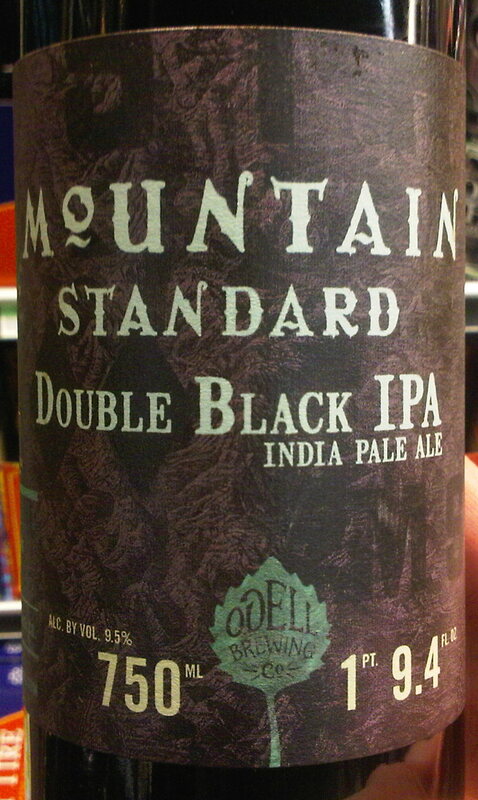 But none have been as big as the latest release in the Odell Mountain Standard Reserve series, Double Black IPA. This 9.5% beer was brewed with hops grown in Colorado, a state not known for a hop-friendly climate. The beer works, though. Odell knows their way around hoppy beers, and they don't let the roasted malts dominate. You will still taste the malt presence (the Black part of the name), of course, but the hops (Double IPA part of the name...you seeing how this works yet?) still come through. The end result is a harmonious blend that makes Reese's jealous. This 25.4 oz. Mountain Standard Reserve release is not as pricey as previous beers in the series: $12.99 at Jubilation, $14.99 at Whole Foods on Carlisle.